How to draw Hitsugaya Toushiro from Bleach Manga. Learn basic drawing technique for Manga, Anime and comics from step by step basic drawing lesson. In this tutorial you will learn to draw a Manga character Hitsugaya Toushiro with basic instruction for beginners. I’ve been a professional concept artist for almost a decade. What I’ve noticed is Whether you are a beginner or pro, the easiest way to draw is to observed your subject then break it down into simple shapes. I usually start drawing with simple geometry shapes to construct the basic Manga head and body. By following this process, you will find drawing is lot easier. The key is to get the shape and proportion as accurate as you can in the beginning. Also make sure the shape of eyes, nose and mouth place in the accurate spot. I usually start of using basic egg shape as a base for character’s head shape, then next step would be figuring out the next geometry form to fit into the image. Tōshirō Hitsugaya ,日番谷 冬獅郎, is the Captain of the 10th Division in the Gotei 13. Tōshirō Hitsugaya is short, has turquoise eyes and short, spiked, white hair, which tends to draw attention in the Human World. Hitsugaya is generally mature and serious, in contrast to his free-spirited lieutenant, Rangiku Matsumoto. Despite their personality differences, he and Rangiku seem very close. 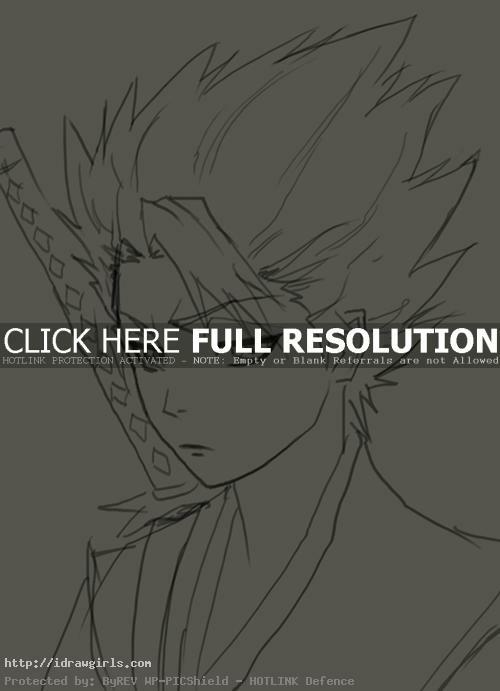 Below are step by step how to draw Hitsugaya Toushiro. Step one, I drew a basic head shape with one vertical line and two parallel horizontal lines intersect right in the middle of the front face. Step two, I drew eyes in between the two horizontal lines, nose half way between eyes and chin right along the vertical line. And mouth is positioned half way of that. Step three, then I drew his hair style on top of his head. Step four, I refined his hair a bit more to give it more natural flow. Step five, I darken the lines around his eyes. Step six, I added his katana and finished up the drawing.